An n-sided regular polygon is inscribed in a similar regular polygon. You can choose the number of sides [from 3 to 20] using the slider. You can vary the inscribed polygon by dragging the GOLD dot. As a function of the number of sides and the position of the GOLD dot can you derive expressions for - - the ratio of the perimeters of the two polygons? 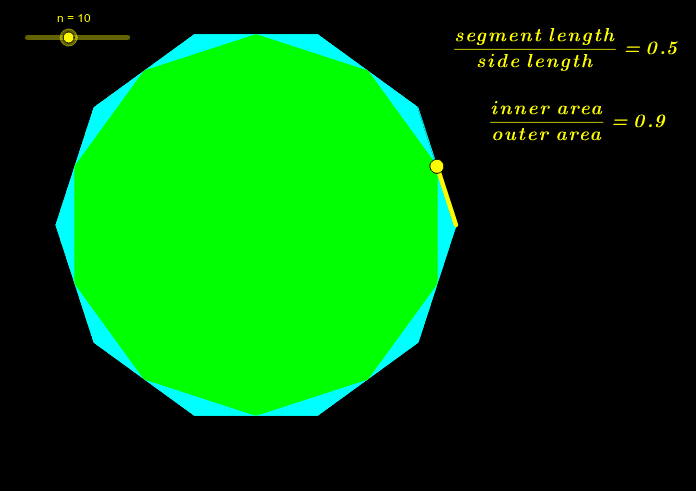 - the fraction of the area of the Blue polygon is covered by the Green polygon?